All quiet in camp at dusk after a glorious ride. From Bend this morning we rode to Sisters, OR for coffee and pastries. On Sunday morning, it felt kind of like a routine weekend ride, the kind most SuperTourists could do in our sleep. 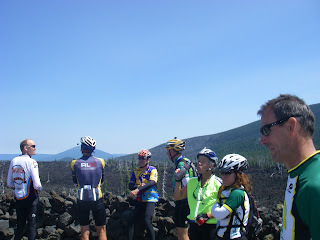 And then for something different, McKenzie Pass. The old road is narrow with light traffic, winding through pine forests. Near the top of a 16-mile climb, the view changes to lava and rock. Open vistas, panoramic views of no fewer than 6 snow-capped peaks. Each peak has a different shape. 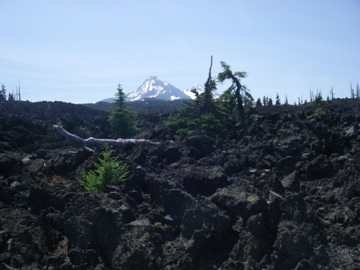 There are several volcanic cones as well. To help orient visitors like us someone built an observatory at the top of the pass out of the volcanic rock. 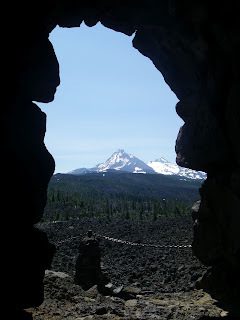 We can view each peak through a small window in the tower, where its name is also etched. Only Mt. Hood, 80 miles north, is obscured by haze. The Three Sisters, Mt. Jefferson, Mt. 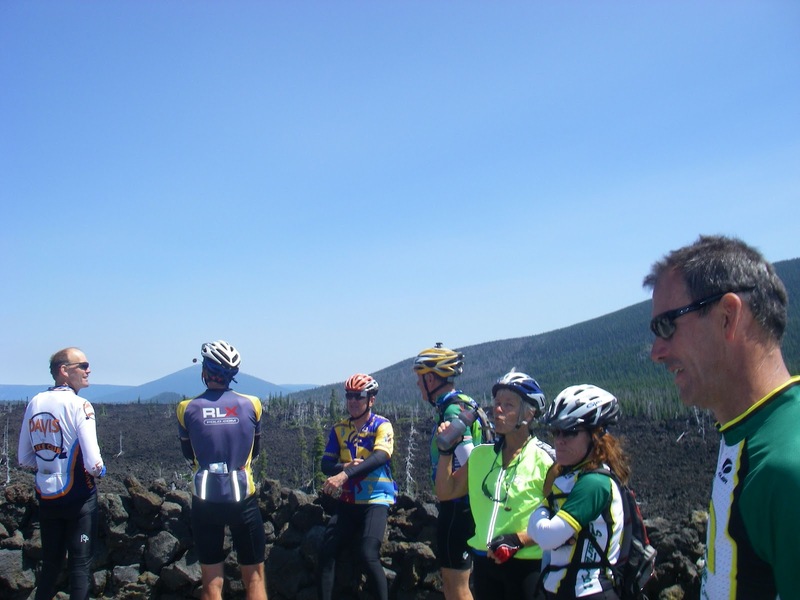 Washington, Black Butte, and many others surround us. Because of its length this climb was not a normal Sunday ride. Even more special is the panoramic view of the Cascade Range. Often you climb a mountain pass and descend the other side without ever seeing the scope of your work. Even in the Alps it's not typical to have this kind of visibility at the top of a pass. It's an unexpected gift. We linger, taking it all in. When it's time to descend, the effort of climbing disappears so fast it just seems to vaporize. The pass is 5 miles or so longer on this side, resulting in some high speeds. If a rental RV hadn't been creaking around the corners in front of me, it would have been a screaming descent. A soak in Belknap Hot Springs, a nap before dinner, a perfect day. Sounds awesome, sweetie! I'm just reading Bill Bryson's Appalachian Trail tale, "A Walk in the Woods." Your comments about views, laundry, and town clothes make a stronger impression after reading his book. Wonderful to read about your adventures! !